There are so many recipes that use raw mangoes that one can make a whole mango series for the summer! I particularly like this relish which is quick, easy and finger-licking tasty. The mix of tastes is just out of this world. First the sweetness, then the saltiness and sourness and finally the heat of chilly powder! 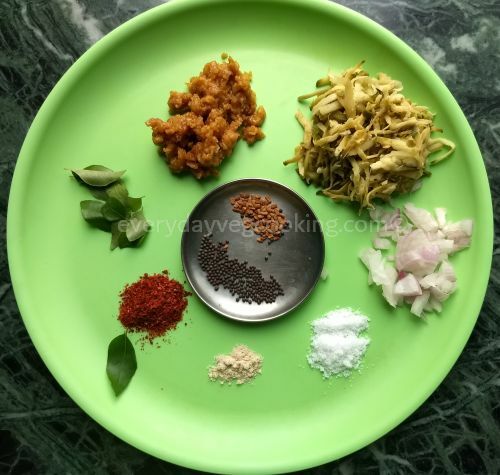 I adapted the recipe of this traditional Maharashtrian recipe, from that of my friend Suranga. Grate the mango with the skin. (Use the large hole for grating). The peel gives it a crunch. However, it is optional and you can also peel it if you like. Chop onions into fine thin strips to match the mango gratings. Add the salt and jaggery and mix. Add the chilly powder and haldi powder to the mixture. Heat the oil in a tadka pan and add mustard seeds. Once it crackles, add the methi seeds and wait for a few seconds till it turns aromatic. Add the curry leaves and hing. Pour the tadka over the chilly and turmeric powder on the mixture. Mix well. The mango-onion relish is ready to serve. This relish can be eaten with parathas or even spread on bread/toast. I like to eat it by itself like a dessert! Do try the recipe and share your comments. Note: I like using totapuri mango, as it is slightly sweet. If the mango is sour, adjust the spices accordingly. The quantity of jaggery and chilly powder can be varied as per taste. Its the high time for mango, will love to try this.